Is your fall as crummy as it has been in Michigan? It has been so rainy/cloudy/cold for most of the month. That kind of weather is really hard on the fiber farmers...when can we ever get our shearing done before the snowflakes fly? I've been waiting for a good day to roll around, and finally yesterday we decided it was "now or never"....so we sheared the four youngest goats and left the three older ones wearing their mohair until next spring. If there is one thing that I absolutely hate, it is a shivering goat! I HATE IT! I feel so sorry to see them quiver. So I get old sweatshirts, cut off the arms and make a slit in the neck, and dress up my goats to keep them warm! Sometimes we go to garage sales or Salvation Army, and sometimes a generous friend will donate a couple of old sweatshirts for our cause. They are all appreciated and get good use! They will wear their shirts for a couple of weeks until their hair grows out to about 1/2 inch or so in length, then we cut the shirts off of them. Believe it or not, they actually like wearing their shirts! Now if we could get some fairly decent dry weather in November....my barns are in serious need to be cleaned out! Is that too much to ask for? When I first started hooking, I listened to a lot of people who said letters were hard to hook and they didn't like doing it. I got a pre-conceived notion in my head that I wasn't going to like letters either. I used to feel weak in the knees just thinking about it! Then one day, I just sat down and decided I was going to tackle it....and I found out that letters ARE NOT hard to hook! I actually like hooking them! I really like Wendy Miller's philosophy about hooking letters. Letters are just straight lines, just like stems or one-line borders. You can hook a flower stem, can't you? Then you can hook letters! Just hook straight on the lines and don't think of them as letters. As I said in my previous post, I used #8 strips to hook my letters which gave them more clarity and crispness. I hooked right on the line that was drawn. First I hooked the longer lines of the letter, then I went back and hooked any lines that intersected, for example, look at the "t". Don't cross under the longer lines with your strip...start and stop your strip on either side of the long line. Then I hooked a row of my background around all of this to hold the shape. Sometimes I crowd things a little and hook real close to the letter to help define its shape. This is definitely one time when it's OK to crowd your loops if you need to. Look at the "H" in the picture...its left "leg" is wider than the rest of the letter. While all the other lettering was hooked in a #8, I'm going to hook this wider part with a #9 strip to make it fatter. I could have hooked it with 2 #8 strips but I think that might have made it TOO fat, so that's why I opted for a #9. You may notice that as I was hooking around my letters, I was getting pretty close to the wavy outside border. I needed to get a line or two of that wavy border hooked in so I could safely continue around my letters. Here's a great plaid for the wavy outside border. I like it because it is going to bring a lot of the tones that I am using in the main part of the design, out to the border. This will be very pleasing to the eye...sort of helps your eyes "walk" around the rug and ties things all together in a harmonious way. I have hooked two rows of it, as shown in the picture below (it looks dark in the photo, but trust me, it works well and I like it). So here you have it! The lettering is completed and I didn't even break a sweat! It looks like a lot of brown values going on here but I am going to start working on the house. Once I get some red wool in there, things will start to change dramatically. The last time I talked about my Harvest Goode Things project, I discussed color and wool choices for the flowers, leaves, and stems. 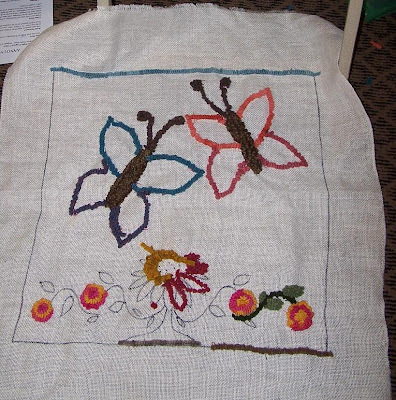 I also hooked a little of the background wool around the flowers. This holds their shapes and also gives me a general idea of how the background color is going to relate to the other colors I have chosen. 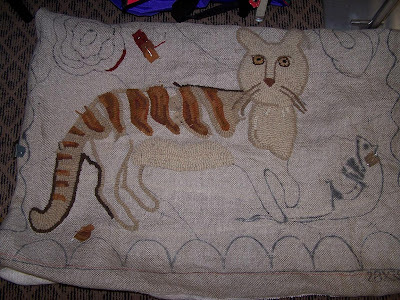 So far, I liked the way everything was coming together so I was ready to proceed on to another area of the rug. I decided that I wanted to hook the house next. I'm going to start with the roof, and therefore the lettering on the roof has to be hooked first and then the roof colors will be hooked in around the letters. Several decisions had to be made...first of all, I wanted a dark brown roof and a red house. I had a great red plaid for the house and found the perfect brown windowpane plaid at Sauder Village. The plaid has some colored threads running through it, one of the threads is blue...cool...it fits right into my "blue theme"! The brown plaid acts like a chameleon wool...in some light it looks brown and in other light, it has a green tint to it. I liked the fact that it wasn't your typical chocolate brown. After deciding on the brown roof, I needed to pick out a color for the lettering. Since I have a "blue" theme running through some of my wools, I decided that I'd like blue lettering. I don't want these letters to jump out too much so I was looking for a subtle blue. I have to be careful of value, as well. I don't want the blue lettering to fade away into the brown roof. At first, I picked this Blueberry plaid. I've used it before and it hooks up to look like denim. I thought the color would work nicely on my brown roof. I want the letters to look nice and crisp so I cut the wool in a #8. I thought #8.5 would be a little bit too chunky. Here's a plaid with a completely different color scheme. It does have some blue, but also some olive green and a bit of orange. I began to think that I might be able to play with the plaid by cutting it and then separating the colors. Hopefully this one isn't going to "sink" into my brown roof. I posted this picture so you could see the brown roof wool and the colors for the letters.On the right is the Blueberry Plaid and on the left is my second choice, the blue and olive plaid. It's pretty evident by this picture that the Blueberry Plaid is just too bright and stands out a little too much! Here's my lettering with the blue and olive plaid. I played with separating the colors in the plaid, hooking a few of the letters with the olive, but made most of them with the blue part of the plaid. I like the way this looks...the letters stand out but seem a little faded. I did hook the letters in a #8 and then hooked around them with the brown, also cut in a #8. Then I ended up hooking the whole roof in a #8 cut...I'm not sure why I did that, I guess I just kept grabbing the #8 strips and filled it in. In hindsight, I think I would have just outlined the letters in a #8, and then filled in a #8.5. Too late now, I'm not going to pull out what I've done. You can certainly mix all kinds of cuts in your rugs and it won't make any difference. I'm just not going to worry about it. I will sit down tonight and hook some of the letters in the sky with blue/olive plaid. I'll make sure to hook some background around each letter. Again, this will hold the letters in place and I can double check to see that I like the way the background and the olive/blue plaid are relating to each other. Then I will focus my attention on hooking the house itself. As you could see in the previous picture, I did hook the chimney and I like the way that looks, so I'll continue with the red plaid. I want to hook directionally, straight across the house with the red plaid. In order to make my straight hooking a little easier, I used my background wool to outline around the house. When you do this, you have to hook outside the line of the house. Then you have a "holding" line, a starting and ending point for your ends. Now there are some other decisions to be made....what color shall I use for the windows? The door? The dividing line at the corner of the house? You'll just have to wait for the next "Diary of a Rug" chapter! We have seen this flock of turkeys lurking around our yard over the past week or so, but they have never gotten this close to the house. I was thinking of getting some cracked corn to feed them but Ken doesn't want to encourage them. Note the light colored one in the upper right hand corner...we don't know much about turkeys, does anyone know what's up with the color variance? As some of you may know, I've had a whirlwind life these past two months! I've hardly had time to do much else but come home, unpack one suitcase and then pack another to dash off to vend at a show or teach a workshop. 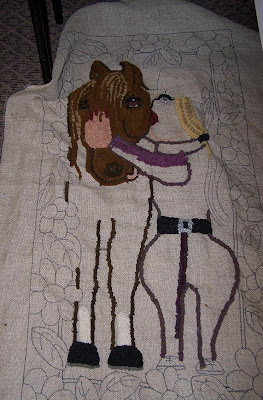 It's been an exciting rug-hooking-gypsy-style life but now it's good to stay at home and keep my feet in one place for a while. Above is a gate in a courtyard in Fredericksburg, Texas. Just gorgeous! Here's Rather Sweet Bakery and Cafe in Fredericksburg. We ate breakfast here one morning. I bought some lovely raspberry scones to take home. They were so hot that they nearly melted the bottom of the bag. Yes, they did make it home but in several large crumbly pieces! Fellow teacher and Michigander, Maria Barton, waiting for Rather Sweet to open! Maria took pictures of my students' rugs below....thanks Maria! This is Aurora's rug, designed by her granddaughter. This was only the second rug that Aurora has ever hooked. And one other special thing about Aurora....she is 80 years young! You go, girl! This is Judy's rug. It's one of my designs called Deer Season. She's doing a fabulous job...love the turquoise star! This is Linda's rug, a design by Bev Conway. Don't you love that horse's face? It already has a wonderful personality. This fabulous feline is being hooked by Georgeanne. 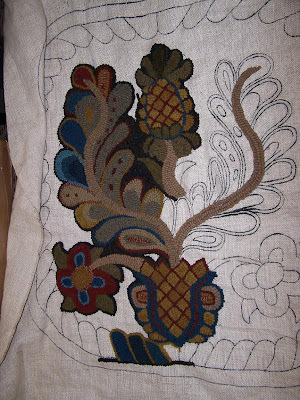 She has a terrific sense of color and this rug will look very old when it is completed. Dianne's rug is simply spectacular! This is an adaptation of the Mary Comstock Bed Rugg. I love the old neutral colors mixed with the primary colors of red, yellow and blue. There were so many other terrific rugs in my class that were not photographed. Some of the gals had to leave before our "show and tell" and we didn't get pictures of them. I assure you that the whole class was working on some beautiful pieces! We had a great group of gals! Now on to the ATHA Biennial in Louisville, KY! (above) Believe it or not, this is the ceiling near the bar. It is tooled leather! Here are some very cool pelicans. They circle around all of the pillars and are made of Rookwood pottery. More tiles on the wall. Isn't this stunning??? Al Capone used to frequent the Rathskeller. It is said that there are secret doors where he escaped when the cops were coming. We got to see one of the underground passages! 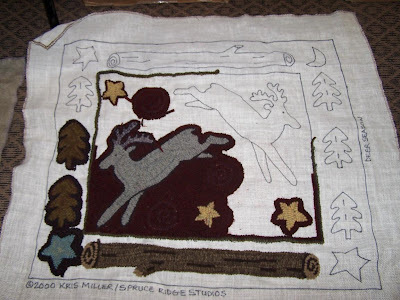 Now that I'm home, I can't wait to get back to my rug hooking project. Look for Diary Of A Rug, Part 2....coming soon! My friend Connie and I went to the Ghoultide Gathering in Northville, Michigan this morning and look who we met !!!! Yes, it's Lori Brechlin from Notforgotten Farm! I could not take a picture of her products but believe me when I say that her booth was exceptionally spooktacular ...*ahem*...spectacular! The shoppers stood literally shoulder to shoulder and crowded the little building shared by other ghoulish vendors. I dare say that by the end of the day, there wouldn't be much left for sale at Lori's table. We had to elbow our way through the crowd to get close and see her creations. Lori was appropriately dressed in a black velvet dress, striped witchy socks and Puritan style shoes....OK, wait a minute...Lori's legs looked like this.... but those are actually MY legs!!! Connie and I got such a laugh from Lori's quirky fashion sense, that we trotted right over to Target after the show and I picked up the same thing! Yes, I'll admit that I'm a copy-cat but I think this is really wicked-good, don't you? Trick or Treat!